The Washington Post’s Metro desk is looking for a reporter to cover government and politics in Montgomery County, Maryland’s largest and perhaps most powerful jurisdiction. This is a crucial role, as our digital and print readers crave local news. We are looking for a reporter who can provide strong and authoritative coverage of county government and elections, which are unfolding in a new era of term limits and public campaign financing. As the Metro desk continues to try to redefine local news coverage, we are looking for someone who can spot trends in Montgomery and tell readers across the nation why what’s happening in Montgomery has resonance for them. Similarly, the successful candidate will be able to explain how national issues have real-world consequences right here in Montgomery County. Covering Montgomery County is a great opportunity to write about issues facing 21st-century suburbs, including immigration, the growing importance of mass transit and the challenges posed by aging neighborhoods and infrastructure. It’s also a great place for accountability reporting, with a budget of $5.4 billion and thousands of employees. In addition, there are nearly a million people who live in Montgomery County, and there are human stories to tell. We are looking for a reporter who can be a collaborative part of our Maryland politics team by helping to cover the upcoming governor’s race and Congressional mid-terms. If you are interested, please contact Debbi Wilgoren (debbi.wilgoren@washpost.com) Monica Norton (monica.norton@washpost.com), Mike Semel (mike.semel@washpost.com) or Tracy Grant (tracy.grant@washpost.com) no later than Aug. 11. The John Delaney for President story was started by a blog. It was kept alive by blogs. And now the bloggers, irresponsible rascals that they are, have been proven right. Will McDonald, a spokesman for Delaney’s campaign, said Delaney is not considering a run for president or opening an office in Iowa. Rumors have swirled recently that Delaney is also taking a look at a run for president in 2020 — talk that was amplified when MSNBC host Chris Matthews, Kathleen’s husband, said during his program last week the congressman was setting up an office in Iowa. A Delaney spokesman denied that his boss had office space in the first-in-the-nation presidential caucus state. So the story was dead, yeah? The problem was that the blogs wouldn’t let it die. Right after Miner’s story, Seventh State noted that Delaney had three federal fundraisers scheduled in May and June. If Delaney were running for Governor, why was he still raising federal money? It did not seem necessary for a Congressional run as he could self-fund such a race. Miner followed up on May 8 with a statement from Delaney’s spokesman shooting down speculation about his wife running for office and emphasizing his consideration of a race for Governor. And on June 15, Seventh State noted even more federal fundraising by Delaney. And now we have it: John Delaney ‘s Washington Post op-ed Why I’m Running for President. Hail to the Great Big Mouths of Doug Gansler and Chris Matthews. Hail to Ryan Miner for being first and sticking with his scoop even though few other outlets bothered to link to his work. Hail to John Delaney for saying it was “ridiculous” that he was running for President and then confirming the rumor in his own words in the Washington Post. And above all, hail to irresponsible rogue blogs. Where would we be without them? Has Montgomery County Lost Its Economic Strength? When I was growing up, Montgomery County was one of the wealthiest counties in the whole country. Many of us remember when Montgomery County’s transportation infrastructure was second to none. Our schools were always ranked number one. We were the envy of the nation. Today, we’re thrilled when we’re in the top ten on any list. Even Councilmember Craig Rice admitted that the Council no longer holds the County in such high regard. It’s as if the County Council doesn’t understand how government works. Montgomery County lags the region in recovering pre-recession job levels. Despite six consecutive years of positive job growth across the region, Montgomery County had 0.6 percent (2,964) fewer jobs in March 2016 compared to the same month in 2006, indicating that job losses sustained during the Great Recession have not been fully recovered. In contrast, the wider Washington, DC metro area added 191,718 new jobs over the decade. Three jurisdictions together accounted for 70 percent of the region’s job expansion: The District of Columbia (82,397), Loudoun County (32,081) and Fairfax County (19,550). While average may be good enough for some Councilmembers, for me, it’s not a passing grade. We must take active measures to boost our competitive advantage in the region. If elected to the County Council, I will work to develop the mechanisms to make it easier for businesses to operate in the County (i.e. lower taxes, easier permitting and licensing, less traffic congestion, and a favorable education pipeline). While growing jobs locally contributes to providing a better quality of life, it also creates an entrepreneurial culture that promotes economic development for everyone. Dr. Tom Ferleman is a Republican candidate for Montgomery County Council in District 2. Delegate Jeff Waldstreicher has announced his suppporter list for his run for State Senate in District 18. His press release appears below. KENSINGTON, Md., July 27, 2017 — Today, Maryland Delegate Jeff Waldstreicher, a Democrat, released a list of community leaders supporting his campaign for State Senate. The release follows Waldstreicher’s official announcement that he is running for State Senate, which occurred last week. The senate seat is being vacated by Sen. Rich Madaleno, who formally announced his candidacy for Governor. Elected in 2006 and re-elected in 2010 & 2014, Delegate Jeff Waldstreicher represents Bethesda, Chevy Chase, Kensington, Silver Spring, Lyttonsville, Wheaton, Rockville, and Garrett Park. A Democrat, he is Chair of both the Subcommittee on Consumer Protection and the Special Committee on Alcohol Abuse. He authored landmark legislation to end the subminimum wage for people with disabilities, and was a leader in the historic fights to recognize gay marriage and end the death penalty. Recently, he has been at the forefront of resisting the Trump administration. Born and raised in Montgomery County, he lives with his wife and three young children in Kensington. Has the Montgomery County Council Backed Our Community into a Corner? The County Council has raised taxes, overspent the budget and failed to grow new jobs locally. Montgomery County lost jobs while everyone around us was gaining them. The pace and scale of property-tax increases over the last decade in Montgomery County are overwhelming. Since 1990, residential property taxes here have grown more than twice as fast as the state’s median household income. Residential property taxes now eat up an average of 6.4 percent of a typical household income in Montgomery County. In 1990, that share was 3.6 percent. In this growing bite of household income lies the pain currently felt by homeowners, whose family budgets have been thrown into disarray. Montgomery County taxpayers are paying more for schools which are below historic standards, roads which are more congested, and services which are stretched to the point of breaking. What are we paying for? More often than not, when citizens talk about cutting taxes, some Councilmembers argue, “but how are we going to pay for services…” This is a narrow-minded answer to a reasonable question. We don’t have to cut services in order to roll back the recent tax increases. In most municipalities, taxable revenue is based on a 60/40 split. Communities often receive 60 percent of their budgetary revenue from residential property taxes and 40 percent from commercial or business-based taxes. However, in Montgomery County, that taxable revenue is based on an 80/20 split. That is, a whopping 80 percent of our taxable revenue comes from residential properties and only 20 percent from commercial properties. In the past three years, Germantown has lost over 1,200 jobs, while a disproportionately high number of women in Montgomery Village have lost jobs in the same time frame. Property tax increases, an anti-business climate, excessive regulations and gridlock have harmed families. Our families are bearing the burden of Montgomery County government’s entire budget on their backs. Property taxes have become a second mortgage that homeowners can never pay off – and an endless expense that grows more costly each year. When I was growing up, the family home was a retirement asset; now it’s a county tax asset. My strategy focuses on building our commercial tax base by growing businesses so that we can reduce the weight of residential property taxes. Silver Spring resident Evan Glass, who lost the 2014 District 5 Democratic primary to Tom Hucker by just 222 votes, has filed to run for County Council At-Large. Glass is a former CNN producer and the current Executive Director of the non-profit Gandhi Brigade. He made big news three years ago when he called for an end to the county’s liquor monopoly. Following is his statement. Over the last few months I’ve had conversations with friends, neighbors and leaders across Montgomery County about the future of our community. The common thread I heard is that Montgomery County is a very special place that we all love, but that our growth in population, struggle to provide equity in our school system, rising cost of housing and need to improve our transportation infrastructure require new ideas and new voices in Rockville. Throughout these conversations I have appreciated the strong encouragement I’ve received countywide. Residents are energized and looking for fresh leadership. I am also excited about entering into the public financing system, which I strongly supported through public testimony before it became law. Over the next 11 months of this campaign, I look forward to having conversations with residents across all corners of the county. Has the Great Recession Returned to Montgomery County? For a decade or so, I’ve grown increasingly concerned for our community. Every morning, thousands of people crawl down I-270 for jobs in Virginia and D.C., jobs that were once in Montgomery County. Those jobs aren’t here anymore. They’ve migrated mostly to Northern Virginia. A commute that should take only 30 minutes now can take upwards of two hours. Indeed, every jurisdiction surrounding Montgomery County, with the exception of Prince Georges County, has added jobs over the last ten years. Montgomery County, according to the County’s own Planning Department’s analysis of 2016 U.S. Bureau of Labor Statistics data, has lost almost 3,000 jobs. While 3,000 jobs lost may not seem like a lot over ten years, compare that figure to the average number of jobs gained by the five surrounding jurisdictions over the same ten years. That number is 34,274; an average gain of 34,000 jobs including Arlington, Fairfax, Loudoun and Howard counties and the District of Colombia. Since August 2013, the U.S. Bureau of Labor Statistics (BLS) has reported a rapid decline in employment and wages in Montgomery County. 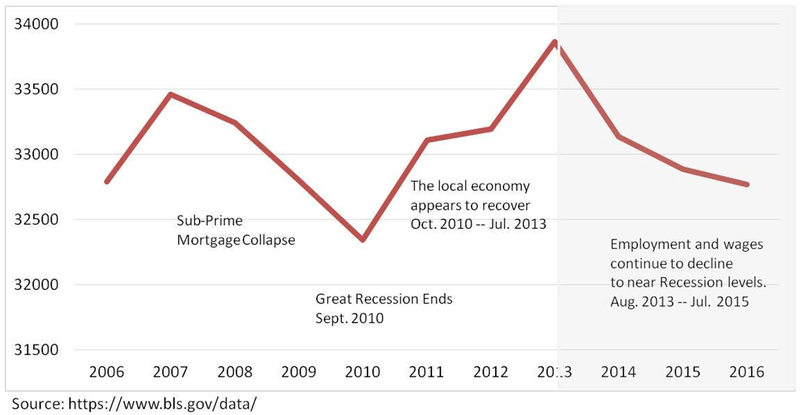 According to the data, Montgomery County lost more jobs from August 2013 to 2016 (an estimated 1,250 jobs) than it did during the Sub-Prime Mortgage Collapse leading to the Great Recession (an estimated 1,000). Not only has Montgomery County lost jobs, clearly our current elected officials haven’t done much to attract new jobs either. Perhaps it has something to do with the anti-business ideology enacted by the County Council over the last decade? The County showed just 1.1 percent job growth from 2015 to 2016 — the lowest of all area counties. And how does the County Council respond? What do they do when thousands of jobs are lost across the County? They raise property taxes a dramatic nine percent last year, followed by another three percent increase this year. As if that’s not enough, they increased the Recordation Tax; that’s a tax on buying and selling your home. And now they’re trying to do it again this year. Who does that? The last thing you do when people are struggling is to take more money from them. I will return homeownership to its rightful place as a family investment asset. I will work to reduce traffic congestion in order to return precious hours in the day to local families and I will fight to #BringJobsHome so that we can boost economic development and establish a work-where-you-live culture in our community. In order to #BringJobsHome to Montgomery County, we must actively recruit anchor companies and top-tier mid-size businesses that will help expand economic development in Science, Technology, Engineering, and Mathematics (STEM) while also fostering family-owned small business entrepreneurship and innovation. My five point Jobs Plan to #BringJobsHome to Montgomery County is one of the most significant ways to increase opportunity and decrease poverty. Both public and private stakeholders in the County must come together to reach agreement and take action to make the economy grow and create local income opportunities for more people. We must make it easier for businesses to operate in the County. Otherwise they will continue to choose other locations to operate. Advancing our competitiveness in the region is essential to giving people opportunities to increase their wages and strengthen their chances for meaningful and stable employment. Furthermore, growing jobs locally provides a better quality of life, increased lifestyle choices, better neighborhood engagement, healthier nutrition, fitness, and family -time and an overall culture that promotes local families and communities. The number one uncertainty in business is time. While businesses can plan for cost, taxes, and fees, they struggle to plan for the time it will take to start and complete a project. We must reduce the time it takes to process permits, gain approval, and achieve a fair return on investment. These changes will strengthen business assurance and draw new smart growth jobs to our community. My five point Tax Plan for rolling back tax increases will provide incentives to businesses that expand in Montgomery County and additional credits to residential homeowners, the elderly, and veterans. Families are feeling the pain as budgets have shrunk and flexible spending has diminished. It’s as if people are renting their homes from the government. In order to return homeownership to its long-term investment value, I will submit a bill to establish a supplemental property tax credit for homeowners whose household income as compared to their tax bill puts an undue burden on their quality of life. My plan will double the maximum property assessment amount used for computing property taxes and change the income formula to allow for eligibility at a higher income level. As part of my #BringJobsHome Plan, I will introduce a ten-year sliding tax credit available to businesses that increase their square footage and the number of full-time employees. As businesses grow, the credit will increase to incentivize local growth. An additional “hometown” credit will be added for businesses that have been in Montgomery County for over ten years. My five point Transportation Plan calls for the County to adopt a culture of smart planning, innovation, rapid implementation and efficient execution that focuses on capacity management. Flexible, community-sensitive design should replace by-the-book engineering that inhibits rapid improvements. I will solve problems with innovation focused on results rather than time-consuming studies. Rapidly implemented on-the-ground fixes will be adjusted in light of experience, and we should move on quickly if they don’t work. Our primary concern should be to alleviate traffic congestion as both an economic and quality of life benefit. We must integrate technology companies, land developers, regional partners and citizens to lead Maryland in innovative traffic management. We must prepare for the introduction of autonomous vehicles, traffic flow timing, sensor-based traffic lights, and adjustable self-governing speed limits for both mass-transit and individual car drivers to ensure community safety concerns are addressed and implementation is efficient, cost-effective, and first and foremost, reduces traffic congestion. An investment in infrastructure is an investment in jobs. Therefore, I support research into building a second crossing over the Potomac and following through with constructing Mid-County Highway Extended (M-83). Transportation improvements must translate to new business imperatives. Smart growth requires an economic and rural balance that maximizes the social-cultural diversity of our community and benefits every citizen equally. My five point Education Plan focuses on preparing students for jobs in our community. A sustainable education pipeline begins with a well-funded school system. We must support strong, family-first early childhood education that prepares young children for success throughout their academic years. It continues with the highest-quality elementary, middle and high school education, all focused on preparing students for success in college and beyond. We must think locally and act globally; the nations of the world are here. Montgomery County is a transient community. Many people move here for government jobs and eventually return to their homes. This varied culture has always ensured that we are a diverse, adaptable, creative and welcoming community. We must develop an education pipeline that maximizes our geographic uniqueness, sees diversity as an opportunity for creativity and allows students to grow as citizens of the world. If we want the best schools, we must be willing to pay for the best talent, resources, and time. Across nearly all measures, our community ranks in the top ten in terms of education but we are rarely number one. We must leap to the front of the room and capture the flag of success by recruiting the best and brightest teachers in the world. Teaching is a calling not just a paycheck; our community understands that and is willing to support our teachers as they dream big and achieve greatness. My plan for Montgomery County is challenging; some might even call it a “bridge too far.” Others will even say that it is too hard. I would respond that our elected officials are hired to do hard things. We expect them to forecast a measurable and emboldened vision and then carry it out. But that’s not what we currently have in District 2. I want to represent my community in measurable ways. Our future requires bold leadership that is willing to look beyond the election cycles and find ways to work across political, geographic, policy and budgetary constraints. I am that leader with a measurable plan for the future of our community. Ignoring a move by some Democrats to avoid early endorsements for Governor, four Senators from Prince George’s County have announced their support for County Executive Rushern Baker. Following is their letter from Baker’s press release. Rushern L. Baker, III: the right Governor for all of us. It is with great enthusiasm and pride that we offer our unconditional endorsement of Rushern L. Baker, III to be the next Governor of the State of Maryland. Over the last seven years, we have worked side by side with County Executive Baker as he has transformed our County through his principled leadership, vision, and unquestioned passion for improving the quality of life for all residents. During his tenure in office, thousands of jobs have been created in the County, property values have risen, crime has been significantly reduced, student achievement rose, previously forgotten areas of the County are being revitalized, and health care access nearly doubled. In short, he is a high-character man of substance with a unique combination of executive, legislative and private sector experience whose achievements in transforming our County provides undisputable evidence that he remains the right choice to serve all the citizens of Maryland as Governor. As public servants with close to a combined hundred years of experience serving the State of Maryland, we believe that more than anything, the majority of Marylanders want empathetic leaders they can trust to make decisions that not only serve the common good, but deliver outcomes for everyday people. Mr. Baker’s record of achievements serve as evidence that he wants to improve the quality of life for all of us by creating a strong economy, efficient government, and a high-quality public education system that creates opportunity regardless of whether a student lives in urban, suburban or rural Maryland. We believe our citizens want a leader with the courage and skill to persuade powerful interests and assure high quality jobs that pay fair wages while also providing quality health care coverage for all. They want a leader who will protect our environment and the Chesapeake Bay so that they have clean air, water, abundant recreational opportunities, and a healthy Maryland blue crab population. They want a leader who will fight for affordable, quality health care, safe neighborhoods, and great housing options for all the hard working people who want to own a home. We believe the leader Marylanders need is Rushern L Baker, III because he has demonstrated commitment to protecting these priorities. He has experience in actually running a government and he isn’t afraid to work across the aisle. For all these reasons, we are excited to begin the work of encouraging everyone to support Rushern L Baker, III to be the next Governor of the great State of Maryland. The long-discussed second bridge across the Potomac may never truly be dead. Dubbed “the Zombie Bridge” by Council President Roger Berliner, the creature will continually claw from the grave as long as its living minions keep trying to shovel it out. 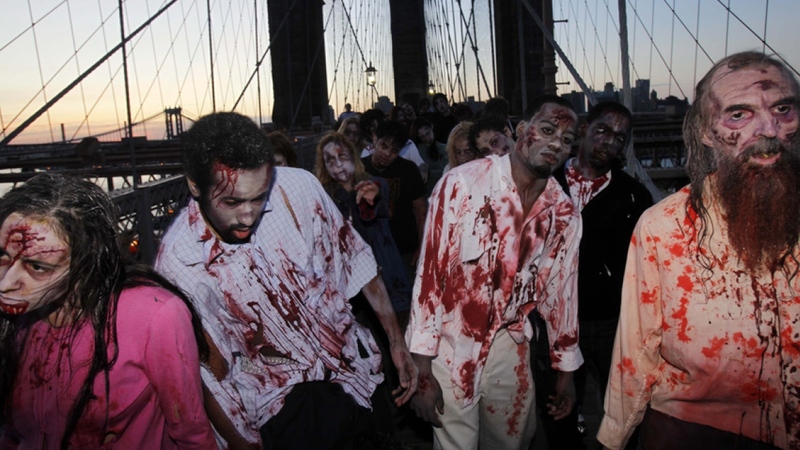 And this time, the zombie’s targets will include county candidates for office. First, a bit of background. Discussions of a second bridge date back to at least the time of the American Legion Bridge’s construction in 1962 as part of a possible Outer Beltway. Montgomery County and the state even included the second bridge in their master plans until it was removed in 1974. Nevertheless, the bridge has been examined several times. Twenty years ago, the bridge and its associated roadway was known as “the Techway” and was the subject of a 2000 federal study requested by Virginia Congressman Frank Wolf. Within months, Wolf asked that the study be canceled after constituents fearful of property seizures mobilized against it. But the bridge was awakened yet again by a 2004 study of the American Legion Bridge which showed some demand among travelers in points west. Anyone have any brains in Maryland? The bridge’s supporters are clustered in two organizations. The first is the 2030 Group, an organization of major developers and construction firms with property in both Maryland and Virginia. Members of the 2030 Group have significant overlap with the board of the Suburban Maryland Transportation Alliance, which also supports the bridge. 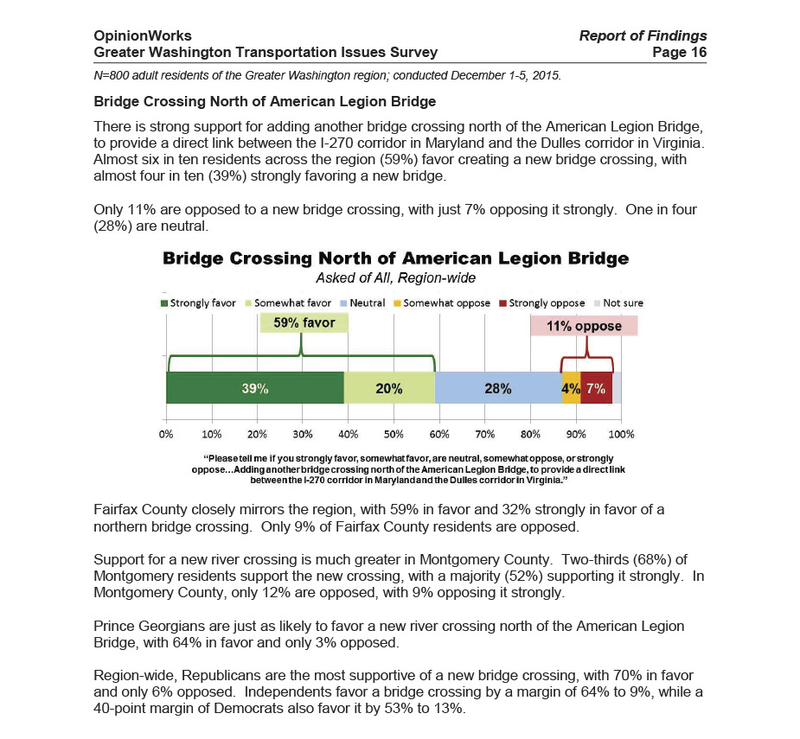 Advocates for the bridge cite a 2015 poll by OpinionWorks of 800 adults in the Washington region that shows substantial support. According to the poll (shown below), 59% of respondents favor the bridge, including 39% who strongly favor it, and 11% oppose it. In Montgomery County, 68% favor (52% strongly) and 12% oppose. The poll does not mention the bridge’s cost (a figure that may not exist in any reliable form yet) or its location. Opponents, including smart growth groups and environmentalists, point out that the project is not just about the bridge itself but also its connection to the county’s road network. The bridge, proposed to extend north from Route 28 in Virginia, is not supposed to terminate at River Road but is intended to connect northeast to I-370 and the Intercounty Connector. How much is that likely to cost? (The ICC cost $2.4 billion.) How much property will have to be seized for its route? (Much of the right of way for the ICC was already in state or county hands as that road had been planned for decades.) Another factor for consideration is that the State of Maryland owns the entire Potomac River between the District and West Virginia. Virginia Governor Terry McAuliffe told Bethesda Magazine, “I don’t fund bridges that aren’t in our state. It doesn’t touch our border. That’s your simple answer… I take responsibility for bridges in Virginia.” That leaves Maryland and MoCo to figure out how to pay for any new bridge. Connect the red stars. 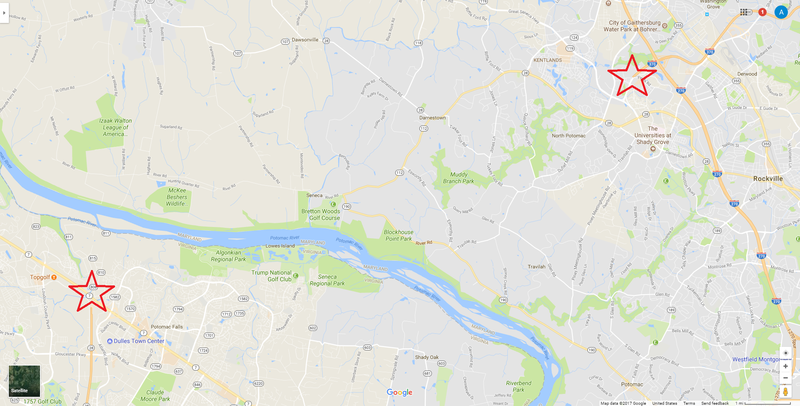 How would you plan a route from a new Potomac bridge to I-370? Despite the unanimous opposition of the Montgomery County Council and no apparent support from Maryland Governor Larry Hogan, the National Capital Region Transportation Planning Board just voted to study a new Potomac bridge. That has effectively resuscitated the project, which now shambles from the grave into the 2018 elections. Because it is now under study, it is certain that we have not heard the last word on the bridge until the June primaries. The deep-pocketed real estate and construction interests who support the bridge may fund an advocacy campaign to sway both candidates and voters on its behalf. Meanwhile, environmental and smart growth groups will include questions about the bridge on every questionnaire they send to candidates and will likely consider it a litmus test issue. All of this will squeeze candidates between major progressive organizations and traffic-hostile voters looking for alternatives to I-270 and the Beltway. MoCo politicians may try to run, try to hide and cry out for help as they flee from the monster, but it will continue to stalk them no matter how hard they try to escape. The Zombie Bridge has returned.